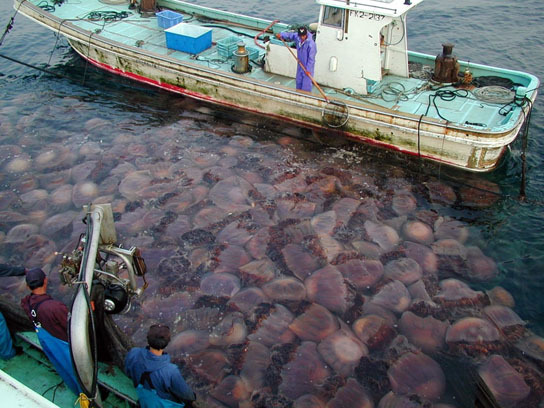 Giant jellyfish clogging fishing nets in Japan. New research from an international team of scientists challenges the claim that the world’s oceans are experiencing increases in jellyfish due to human activities such as global warming. The study states that while certain areas have experienced increases in jellyfish, other areas have experienced decreases. The scientists believe research needs to be done on the long-term data rather than short-term data to get a better understanding of changes in jellyfish blooms. Santa Barbara, California –– Blooms, or proliferation, of jellyfish have shown a substantial, visible impact on coastal populations –– clogged nets for fishermen, stinging waters for tourists, even choked intake lines for power plants –– and recent media reports have created a perception that the world’s oceans are experiencing increases in jellyfish due to human activities such as global warming and overharvesting of fish. Now, a new global and collaborative study conducted at UC Santa Barbara’s National Center for Ecological Analysis and Synthesis (NCEAS) questions claims that jellyfish are increasing worldwide and suggests claims are not supported with any hard evidence or scientific analyses to date. The results of the study, led by Rob Condon, marine scientist at the Dauphin Island Sea Lab (DISL) in Alabama, appear in the latest issue of the journal BioScience. Condon’s co-authors are comprised of experts from the Global Jellyfish Group, a consortium of approximately 30 experts on gelatinous organisms, climatology, oceanography, and socioeconomics from around the globe, and include co-principal investigators Carlos Duarte of the University of Western Australia’s Oceans Institute and the Instituto Mediterráneo de Estudios Avanzados in Spain, and Monty Graham of the University of Southern Mississippi. “Clearly, there are areas where jellyfish have increased –– the situation with the Giant Jellyfish in Japan is a classic example,” says Condon. “But there are also areas where jellyfish have decreased, or fluctuate over the decadal periods.” Condon says understanding the long-term rather than short-term data is the key to solving the question about jellyfish blooms. The study highlights the centerpiece of their research collaboration with NCEAS –– the formation of a global database called the Jellyfish Database Initiative (JEDI) –– a community-based database project that is being used in the global analysis and to test the worthiness of the current paradigm. The database consists of over 500,000 data points about global jellyfish populations collected from as early as 1790, and will serve as a future repository for datasets so that the issue of jellyfish blooms can be continually monitored in the future. By analyzing JEDI, the group will be able to assess key aspects behind the paradigm, including whether current jellyfish blooms are caused by human-made actions or whether we are simply more aware of them due to their impact on human activities, such as over-harvesting of fish and increased tourism. “This is the first time an undertaking of this size on the global scale has been attempted, but it is important to know whether jellyfish blooms are human-induced or arise from natural circumstances,” says Condon. “The more we know, the better we can manage oceanic ecosystems or respond accurately to future effects of climate change. Be the first to comment on "New Study Questions the Claims of Worldwide Increased Jellyfish Blooms"